Many of us fell in love with Excel as we delved into its deep and sophisticated formula features. Because there are multiple ways to get results, you can decide which method works best for you. For example, there are several ways to enter formulas and calculate numbers in Excel. Short Lists: =SUM(B4,B5,B6,B7); =SUM(B4+B5+B6+B7). Or, place your cursor in the first empty cell at the bottom of your list (or any cell, really) and press the plus sign, then click B4; press the plus sign again and click B5; and so on to the end; then press Enter. Excel adds/totals this list you just “pointed to:” =+B4+B5+B6+B7. =COUNT(B4:B13) Counts the numbers in a range (ignores blank/empty cells). =COUNTA(B3:B13) Counts all characters in a range (also ignores blank/empty cells). Narrow your search a bit and choose a formula subset for Financial, Logical, or Date/Time, for example. Click the Recently Used button to show functions you've used recently. It's a welcome timesaver, especially when wrestling with an extra-hairy spreadsheet. =AVERAGE(B4:B13) adds the list, divides by the number of values, then provides the average. =MAX(B4:B13) returns the highest value in the list. =MIN(B4:B13) returns the lowest value in the list. Use the AutoSum button to calculate basic formulas such as SUM, AVERAGE, COUNT, etc. 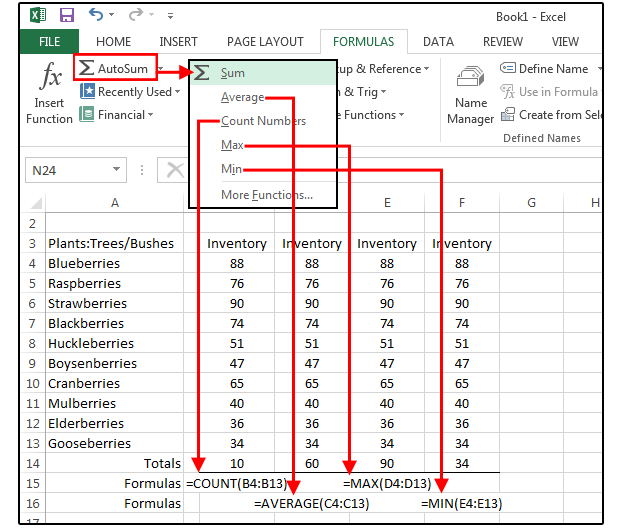 Note: If your cursor is positioned in the empty cell just below your range of numbers, Excel determines that this is the range you want to calculate and automatically highlights the range, or enters the range cell addresses in the corresponding dialog boxes. Bonus tip: With basic formulas, the AutoSum button is the top choice. It’s faster to click AutoSum>SUM (notice that Excel highlights the range for you) and press Enter. Another bonus tip: The quickest way to add/total a list of numbers is to position your cursor at the bottom of the list and press Alt+ = (press the Alt key and hold, press the equal sign, release both keys), then press Enter. Excel highlights the range and totals the column. The five formulas below may have somewhat inscrutable names, but their functions save time and data entry on a daily basis. This is a handy formula to calculate the number of days between two dates (so there’s no worries about how many days are in each month of the range). This similar formula calculates the number of workdays (i.e., a five-day workweek) within a specified timeframe. It also includes an option to subtract the holidays from the total, but this must be entered as a range of dates. TRIM is a lifesaver if you’re always importing or pasting text into Excel (such as from a database, website, word processing software, or other text-based program). So often, the imported text is filled with extra spaces scattered throughout the list. TRIM removes the extra spaces in seconds. 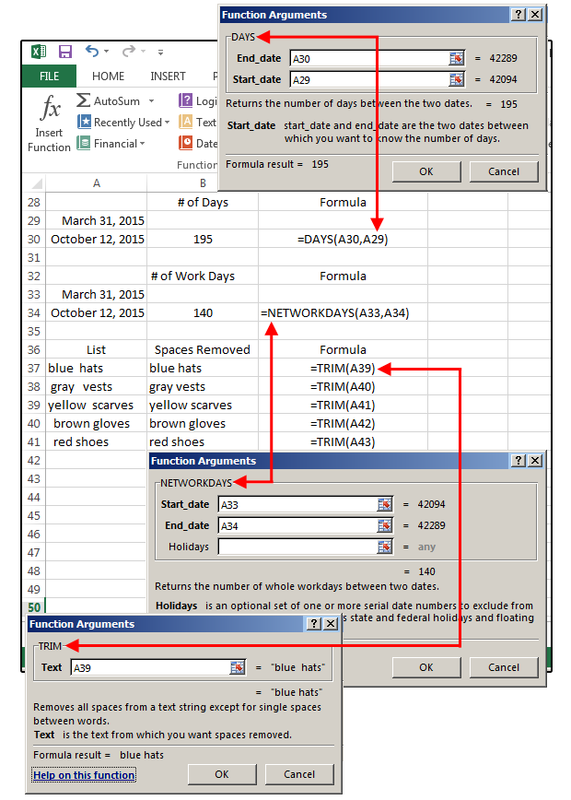 In this case, just enter the formula once, then copy it down to the end of the list. 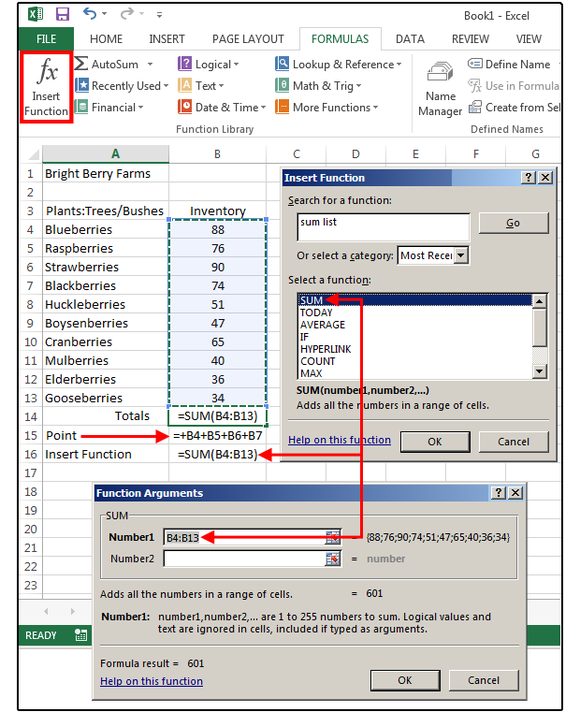 Example: =TRIM plus the cell address inside parenthesis. This is another keeper if you import a lot of data into Excel. This formula joins (or merges) the contents of two or more fields/cells into one. For example: In databases; dates, times, phone numbers, and other multiple data records are often entered in separate fields, which is a real inconvenience. To add spaces between words or punctuation between fields, just surround this data with quotation marks. Example: =CONCATENATE plus (month,”space”,day,”comma space”,year) where month, day, and year are cell addresses and the info inside the quotation marks is actually a space and a comma. 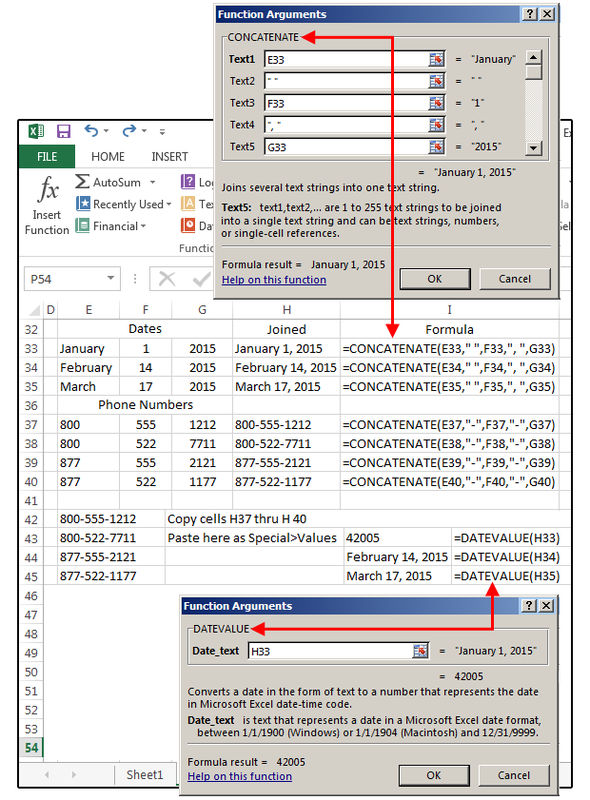 DATEVALUE converts the above formula into an Excel date, which is necessary if you plan to use this date for calculations. This one is easy: Select DATEVALUE from the formula list. Click the Date_Text field in the dialog box, click the corresponding cell on the spreadsheet, then click OK, and copy down. The results are Excel serial numbers, so you must choose Format>Format Cells>Number>Date, and then select a format from the list. Tip 1: You don’t need another formula to convert formulas to text or numbers. Just copy the range of formulas and then paste as Special>Values. Why bother to convert the formulas to values? Because you can’t move or manipulate the data until it’s converted. Those cells may look like phone numbers, but they’re actually formulas, which cannot be edited as numbers or text. Tip 2: If you use Copy and Paste > Special > Values for dates, the result will be text and cannot be converted to a real date. Dates require the DATEVALUE formula to function as actual dates. Tip 3: Formulas are always displayed in uppercase; however, if you type them in lowercase, Excel converts them to uppercase. Also notice there are no spaces in formulas. If your formula fails, check for spaces and remove them.